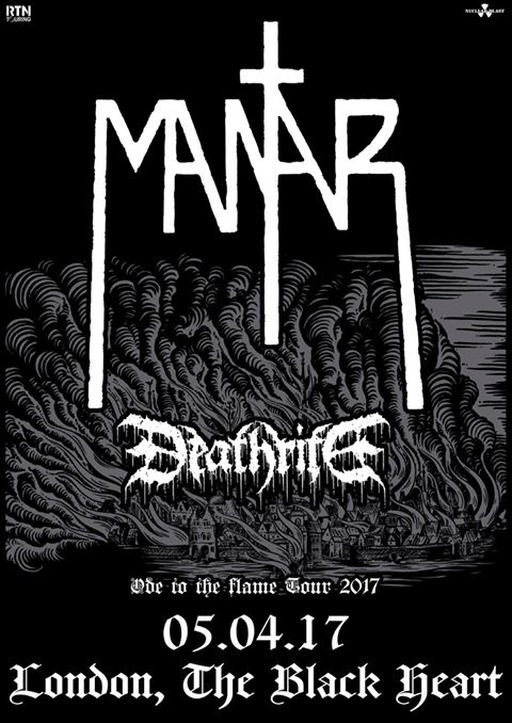 It’s another busy week for metal and doom in general as German Death Doom duo Mantar put on another night at Camden’s Our Black Heart with fellow countrymen Deathrite – an old school death metal troop and a relatively unknown blackened doom trio from Brighton, UK. It’s a re-run of their mental show they put on here last year at Desertfest London and it’s with more than a little excitement that I head back to the ever familiar streets of Camden Town. I make my way through hipsters and hobo’s, doomy bearded dudes with dodgy top knots and squeeze through to the bar for a decent craft beer on tap in an awesome venue for underground music with great decor and a great atmosphere. It’s a small capacity room upstairs in the Black Heart, but these bands have brought more merch with them than anyone I’ve ever seen. The guys from Mantar are a hard working 2 man team and I have the chance to chat with the bands singer before the first band Solleme take the stage. Personally I’m more than a little disappointed at the turn out tonight as the venue has about 20 people in it when tonight’s openers take to the stage and I shake the man’s hand before he disappears backstage. Primordial was on the Friday night before this and Grand Magus on the Monday and finally Pallbearer tomorrow night too, and it seemed to me that this small underground gig got lost amongst all the other metal going on around it. Old Empire as promoters do put on some great shows with killer line ups but it seemed to me that they just didn’t commit enough time and resources to promoting this mid-week gig. I genuinely feel sorry for the German’s who are tonight playing a single token UK show on their Ode to the Flame tour. Back in their German heartland they are used to filling much much larger venues and playing sold out shows, here sadly the gig is painfully undersold. Anyway, this isn’t going to stop the metal flowing and the fans that are here are definitely making the most of it, me included.